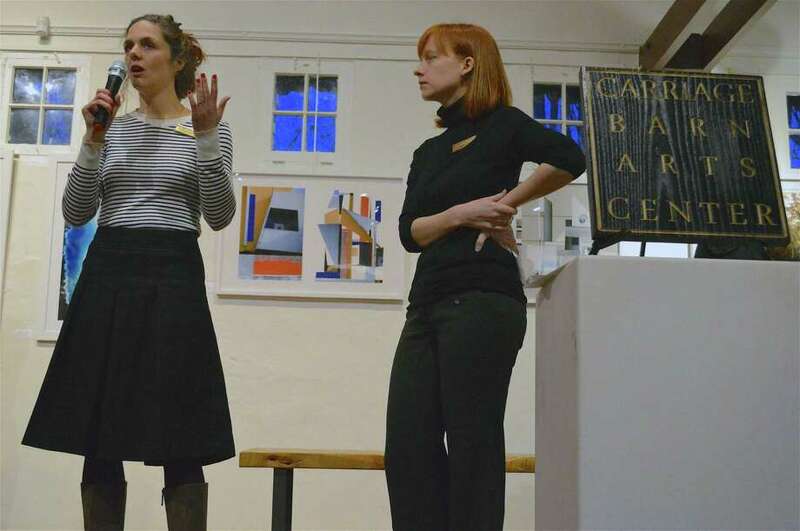 Jurors Claartje van Dijk, left, and Susan Carlson of the International Center for Photography share their thoughts at the opening reception for the Carriage Barn Arts Center's 39th Annual Photography Show, Saturday, Jan. 12, 2019, in New Canaan, Conn.
NEW CANAAN — Some of the most talented photographers in the New England region celebrated their work Saturday night at the opening reception of the Carriage Barn Arts Center’s 39th annual photography show. “We had about 800 submissions,” said executive director Hilary Wittman. Just 104 pieces by around 70 photographers making the grade for the exhibition, which runs through Feb. 15. Claartje van Dijk and Susan Carlson — two curators from the International Center for Photography in New York City — juried the show. “It’s a real act of courage to put yourself out there and share your work,” she said.